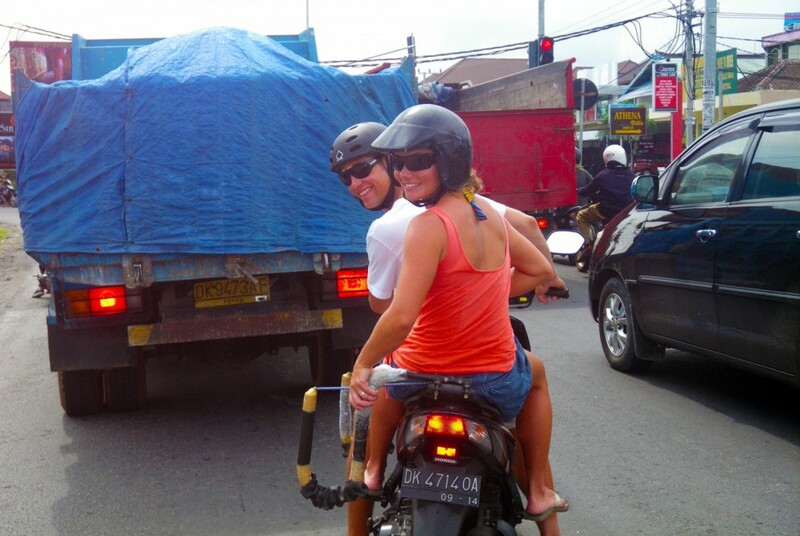 Yesterday afternoon we grabbed a cab to Seminyak square and did a bit of wandering around the shops. Tonnes of surf stuff, boutique clothing, restaurants, and most enjoyably housewares! This place could be dangerous for purchasing goods, especially because they ship them home for you. Because we’re going to be doing a few reno’s on our new purchased home, we might think about grabbing some cool items.. like buddha’s, sinks, cushions, lawn furniture.. who knows. The possibilities are endless. Mmmmm. We must go back there. This morning after breakfast we did a walk on the beach to the left/south for about 15 minutes each way, along the dark volcanic sand. It was pretty much deserted, as the land isn’t very developed yet. There was a disappointing amount of trash, shoes, and other items washed up on shore with the driftwood and the water, clouds, and sand, all dark, seemed a bit gloomy, not to mention the monster waves crashing loudly on the shore. We decided to check out the opposite direction, to walk to Echo Beach (and the Beach House Restaurant where we ate the other night). It took about 25 minutes, with brief stops to watch some surfing groups. Thankfully the walk was cloudy (although I’ve still got a sunburn), but just as we got to Echo Beach the downpour started, so we parked for a drink and some lunch. Today is the second day of a Hindu Holiday, so it made catching cabs a bit more difficult, we almost ended up walking home in the thunderstorm. We think maybe the Hurley surf team were doing some photoshoots there today. The pier almost had the feel of the base of a ski hill with racks for the boards lined up alongside the tables with surfers having a break and a bite to eat, only here with warm weather and much less clothes. Unfortunately, the rain may have wrecked their plans, at least the photographers. There’s a great advanced wave right in front, which held onto its riders well into the rain. For something different, and maybe cultural, we opted to try out a yoga class today at the Desi Sena Village. I have done my fair share of yoga, but Josh had his first time (hehe). It was an amazing location, Alice & Wonderland Bali style. With cute little bali huts scattered throughout the grounds, fountains, pools, colorful umbrellas, with stepping stones and bridges leading you through to the yoga hut. A teak floor, and all open air with lush tropical plants surrounding the area, had the freshest smell, and maybe the mats were sprayed with eucalyptus?! It was lovely. The weather today was slightly cooler, with a slight breeze just after the rain. We still sweat like banchees with the yoga. It’s hot yoga. And I would go back just to take some pictures of the resort. Tomorrow, we’ve hired a driver to take us up to the town of Ubud, and hopefullywe’ll hit a few temples along the way and have some more photos to show. So far its been limited, we’re trying to remember to take the camera along. And we found out that our friends we were supposed to meet are indeed coming tomorrow to meet us, so that was our good news of the day.